Discussion in 'Create-A-Card' started by Nanashii, Mar 29, 2008. Ok, so I like making sets, I dunno why, my last one was flounder because I lost track of EVERYTHING, plus it was so un-original, so.. I decided to try something new, equivalent to Delta Species and Team Rocket, Team Aqua/Magma I created, POKEMON: Pure Chaos. Legendary Pokemon Clash, it's in they're nature, but what happens when too much of they're power clash? In a warped world created by the endless battling of Space and Time Pokemon Pokemon: Pure Chaos takes you too a future where humans are exstinct, they're remains tainted the earth and thus created "Chaos Pokemon" Pokemon bent on vengence against the human's creations, Trainers of Past and present must ban together with the equally challenging "Purity Pokemon" but can the light of a Pure Pokemon defeat and Purify the tainted heart of a Chaos Pokemon? a Pokemon who only knows how to cause pain and misery? Heroes of legend band together from all times to enter the Genocide of all Pokemon. 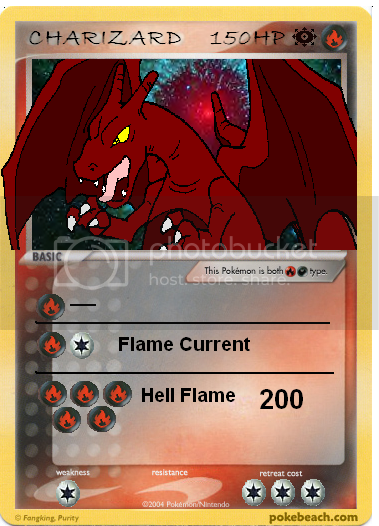 - Every Card thats translated will be marked with a "*"
- I tried to make note that I wanted the Pure version of Chaos Pokemon appearing in the set matched they're evil counterpart's powers, hense, not every Pure Pokemon will have the same ability. - FUTURE SETS WILL BE RELEASED following the completion of each set. 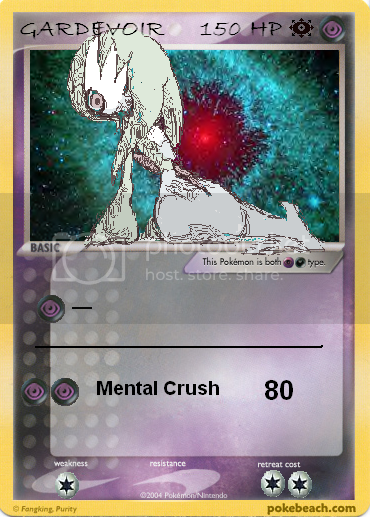 Poke'Power - Will Crush: As long as this Pokemon is your active Pokemon all your opponent's Active Pokemon are asleep (flipping head in between turns does nothing), ignore this effect if the defending Pokemon is a "Purity Pokemon"
(CP)(CP) Mental Crush - 80: This attack does nothing if the defending Pokemon isn't asleep, discard 2 Energies attached to Chaos Gardevoir. Poke'Body - Flash Fire: Any Attacks from a (R) pokemon other then a "Purity Pokemon" is reduced by 30, if the damage is 30 or less remove 2 damage counters from Chaos Charizard. (CR)(C) Flame Current - Search your discard pile for 2 (R) energy, attach one to Chaos Charizard and attach the other to a benched Pokemon, if there are no benched Pokemon only take 1 (R) energy. 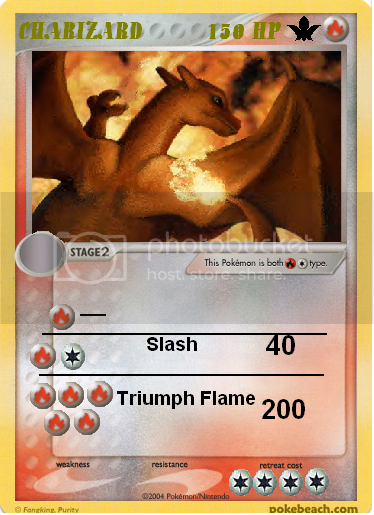 Poke'Power - Bright Scorch: As long as "Charizard" is on your bench each of your (R) Pokemon's attacks have: Flip a coin, if heads the defending Pokemon is now Burned. Pure Ability - Bright Flame: As long as you have a "Pure Energy" attached to this Pokemon, every (R) Energy attached to Charizard is treated as a "Pure Fire Energy", treat "Pure Fire Energy" as a special Energy with the following effect "reduce attacks from (D) Pokemon by 10 for each (PR) energy attached to this Pokemon". Poke'Body: Devoted Protection: As long as "Gardevoir" is your active Pokemon reduce all damage to your benched Pokemon by 20. 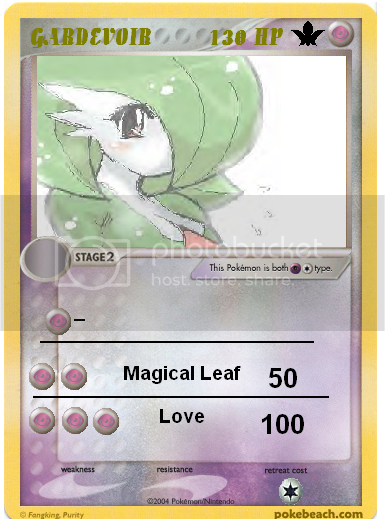 Pure Ability: See into The Heart: As long as you have a "Pure Energy" attached to this Pokemon, every (P) Energy attached to Gardevoir is treated as a "Pure Fire Energy", treat "Pure Psychic Energy" as a special Energy with the following effect "reduce attacks from (D) Pokemon by 10 for each (PP) energy attached to this Pokemon". (PP)(PP) Magical Leaf - 50: You may subsitute (G) energy for (PP) to use to this attack. (PP)(PP)(PP) Love - 100: remove 10 damage from each of your opponent's benched Pokemon, if any of them are (D) you may discard an energy attached to that Pokemon. Discard one card from your hand to use this card, Keep this card in play until the end of the turn, if your active Pokemon's Name has "Charizard" in it, for this turn only, your active Pokemon requires you to discard energy to use an attack discard this card instead. Discard one card from your hand to use this card, Keep this card in play until the end of the turn, if your active Pokemon's Name has "Blastoise" in it, for this turn only, you may attach as many (W) energy from your hands to your Pokemon in any way you like. Discard one card from your hand to use this card, Keep this card in play until the end of the turn, if your active Pokemon's Name has "Venusaur" in it, for this turn only, you may flip a coin equal to the amount of energy attached to your Pokemon in play, for each heads search your deck for an Evolution card and place them in your hand, Discard this card afterward. Search your deck for a Stage 1 or Stage 2 Pokemon that evolves from your active Pokemon and play it on your Active Pokemon (This counts as evolving it). You may only use this card if your opponent has more cards in his/her hand then you, shuffle your hand into your deck and draw 7 cards. You may search your deck for 1 "Psycho Energy" or "Pure Energy" and put it in your hand, shuffle your deck afterwards, you cannot play anymore "Mystic Energy Search" this turn. Choose up to 3 Basic Pokemon, Evolution cards and/or Basic Energy cards from your discard pile and shuffle them into your deck. (C)(C) Cut - 40: The Pokemon using this attack is treated as a "GRASS-Type" until the end of your turn. Shouldn't there be more Chaos Pokemon? You just did both of them. Make more of the Rares/ Rare Holos Chaos Pokemon. [F] is Fighting, [R] is Fire. Well, how can you have a set of Pure Chaos with only 2 of them? What's with the Double Energy requirements? Are you makeing these by your self? basically specially designed energies, they cannot use the attack unless they have those special energies, note that the abilites on the pokemon state that if you have "psyco energy" or "pure energy" attached to pokemon thedy make specific type of energy those energies. Its just to make the game harder, its meant for people who enjoy a dragged out game as apposed to the pansies who want to win asap. I won't be able to update considering my only hand is already exhausted, half of what I typed was a typo considering my broken arm is in my way.